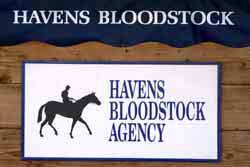 From our first auction sales consignment nearly thirty years ago, it has been the goal of Havens Bloodstock to elevate the activity to the very highest level of professionalism, so that everything is done that can be done to maximize the value of each horse in our consignment. We believe in the effectiveness of the aution process and that every detail involved lends itself to a successful outcome. Our goal is to be the best, offer the best presentation, employ the most experienced personel, provide the most forthright and complete information and develop a reputation second to none.